You have spent countless hours training in preparation for your IRONMAN. Each weekend the focus has been doing long-course specific training for optimal performance. However, race specificity remains one of the most important factors to long-course racing success. One of the best ways to get this race specificity (without overtraining) is to incorporate aquabikes and duathlons into your IRONMAN training. Two-disciplined races (aquathons, aquabikes and duathlons) are great ways to leverage opportunities to gain necessary experience for optimal performance. With a little research you’ll also find more and more of them popping up around the world. Just remember, none of these events should be viewed as your “A” race for the season, but instead as important tune-ups toward your overall long-distance racing goal. 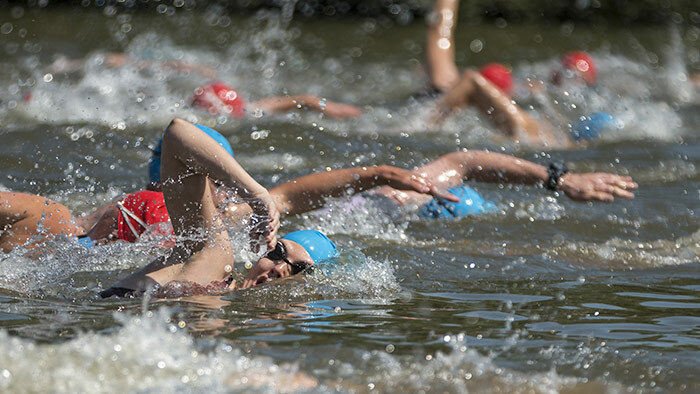 The swim remains one of the more dreaded legs of long-distance racing for many IRONMAN athletes. Because of this, many athletes avoid doing any open water racing. However, in an aquathon, athletes will get to practice swimming in large packs of people—an opportunity that does not happen in the pool or an open water session with a friend. This will help lessen the anxiety of a mass start when experienced prior to the IRONMAN race day. In an aquabike, athletes will go from a hard swim to a hard bike. This is often neglected in a training program, yet so essential to start the bike feeling strong. Lastly, duathlons will help athletes figure out proper run pacing after being fatigued from another run and hard ride. Duathlons can also be used to gain valuable race experience during cold winter months (ideal for those racing early season IRONMANS) when open water swimming is not an option. Besides vital experience, two-disciplined events (particularly the aquathon and aquabike) will not leave as much fatigue as a full triathlon due to the lack of any running. As many IRONMAN finishers can attest, it’s really the marathon at the end that gets you. Because of the lack of running impact, athletes can also train through these races, compared to an IRONMAN 70.3 which requires a proper taper and recovery. The shorter recovery will allow athletes to get back into training faster while still gaining valuable race experience. Transitions are often a neglected part of long-distance triathlons. However, how many times have athletes lost Kona spots or podiums by minutes, or even seconds, at the end of an endurance event? Two-disciplined races emphasize the importance of a speedy transition, and can give you an opportunity to practice new strategies to save time. Transitions can be free speed, yet they are rarely practiced during a typical training week. Unfamiliarity breeds avoidable mistakes. That said, athletes can afford to make mistakes in races leading up to their big “A” race. Aquathons and duathlons are also great opportunities to practice your race-day nutrition plan so you can make any necessary changes ahead of race day. Sometimes in training your nutrition needs will differ as you lack the right intensity, however lower priority races like these are great opportunities to see just how your body responds to certain nutrition strategies when you up the pace a bit. In conclusion, consider two-discipline races as great opportunities to race hard and make mistakes that will lead to success later on during your IRONMAN. Enter a local two-disciplined race and get out of your comfort zone to help you reach optimal performance when it counts.